Soccer is gaining more popularity in Los Angeles, Why? Los Angeles has 2 two professional clubs playing in major soccer leagues, where the passion is strongly embedded in soccer fans. Also, the city has experienced very important soccer moments like hosting the 1994 World Cup final. This really provides a professional soccer vibe in Los Angeles. However, this is not the only form that soccer takes. A less structured and organized way of soccer is very present; pick-up soccer. This not only brings soccer fans together, but also creates some of the most exciting matches. If you are interested in being part of pick-up soccer culture, you should know where the hot spots are. 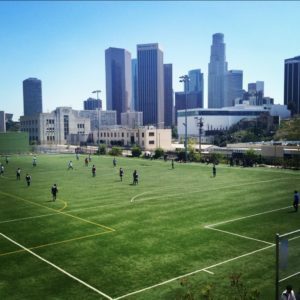 In collaboration with CeleBreak, an international pick-up soccer organizer, some of Los Angeles top soccer fields will be described in this article. These, are spots with well-maintained fields, great views, where other soccer fans can be found and are accessible for everyone. Also known as Bradford Jamieson IV, favorite pick-up spot, located in the Westside. It is a park with several recreational purposes, including a turf field. The park its surrounded by palm trees, creating a relaxed atmosphere, ideal to build on some competitive vibe. Different soccer fans can be found on the pitch, making it a great place to just come and start playing soccer. The field is often used for leagues for that reason, the best times for a pick-up session are early in the mornings or late at night. 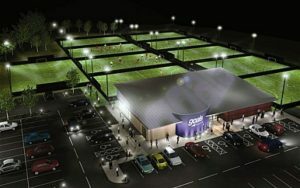 If you are concerned about not having a spot to play, then you can improve your chances at Goals Soccer Center at South Gate with 11 turf fields!! The sizes of the fields are ideal for 7v7 or 5v5 pick-up sessions. You also have the possibility to reserve a pitch through their website, to make sure you have a spot. Lastly, if you are not looking to play but rather watch a match, there are several leagues that play there too ! So you will be able to enjoy a competitive and serious match. Providing one of the most beautiful views of Downtown Los Angeles, you get a really nice scope of the city. Making it a great place to contemplate on one’s defeat or victory from a previous match. There are two full-sized turf fields located next to each other, these are often reserved for leagues. So, you do have to get out of your way to find a place to play. It is called sports park for a reason, it has soccer field, baseball field, basketball courts and tennis courts. This park has it all ! !For the soccer fans, it provides a unique soccer experience, because many international soccer fans are ready to play. Even though, it is often spoken in different languages, it always results in a good somewhat competitive match. 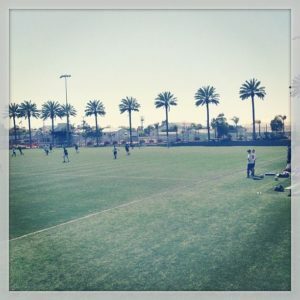 The field is ideal for 7v7 or 5v5 pick-up session, creating a good balance for a good match. These are the most popular fields for a pick-up session, there are many other places where you can play and enjoy a good match. 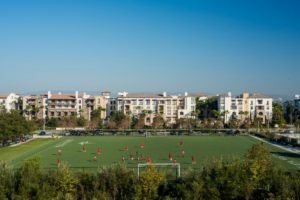 Due to the increasing popularity of Soccer, there will be times in which the fields are occupied, so if you want to make sure to get a spot you should join the CeleBreak community. Through their app, you can easily sign for any match and make sure that you can experience playing in these amazing fields.